The Cedar Cutter, Murwillumbah, New South Wales. Big Volcano Feature Story, local history. Timber cutters and cedar getters. Hint: use your right mouse button to open a new window for external sites. Murwillumbah: Place of Many Possums and Great Lunches! The Cedar Cutter is a well known and locally beloved sculpture located adjacent to the car park in Knox Park, Murwillumbah. It has withstood the ravages of the weather, just as many of the cedar getters did, since its erection in 1988. In 2011-2012, it was removed for maintainance to the cedar stump and refurbishment of the cedar statue. It is now back in its familar place of glory for anyone who want s to admire it, when they visit the park and take a stroll through it. The original text and brochure images below are © and reproduced with the kind permission of Phil Taylor, Taylor-Made cars. No. 5 Prospero Street, South Murwillumbah. Phone (02) 6672 4461. In 1823, Lieutenant John Oxley discovered and sailed up the Tweed River, the log recording that the scenery exceeded anything they had previously seen in Australia. With the backdrop of mountains it was similar to the Tweed River in Scotland. There was no mention of cedar from this expedition even though members of Oxley's group would have recognised this sought-after timber. Image right. Original brochure image. In 1828, a military outpost was established at Point Danger aimed to recapture prisoners escaping from the penal settlement at Redcliffe (Brisbane) where most of the prisoners were engaged in cedar getting around Moreton Bay. Cedar stands were discovered in Northern New South Wales in the Clarence District around 1837 and the cedar getters gradually moved up to the Richmond in the early 1840's to arrive on the Tweed about 1842. In 1843, more cutters arrived on the Tweed from Brisbane in the north. The cedar cutters worked in felling, cross-cutting logs and making tracks to bring the cedar out. The logs were either rolled or drawn out by bullock teams to water courses which led to the river where they stacked to await a fresh [flood] which would float them further on their journey, each log carrying the individual's owner brand. Further down the river a chain was drawn across the stream to stop the logs. 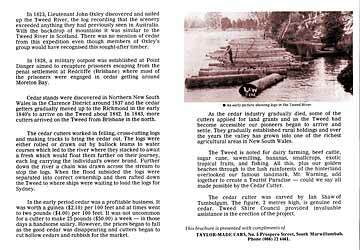 When the flood subsided the logs were separated into correct ownership and then rafted down the Tweed to where ships were waiting to load the logs for Sydney. In the early period cedar was a profitable business. It was worth a guinea ($2.10) per 100 feet and at times went to two pounds. ($4.00) per 100 feet. It was not uncommon for a cutter to make 25 pounds ($50.00) a week - in those days a handsome salary. However, the prices began to fall as the good cedar was disappearing and cutters began to cut hollow cedars and rubbish for the market. As the cedar industry gradually died, some of the cutters applied for land grants and as the Tweed had become accessible our pioneers began to arrive and settle. 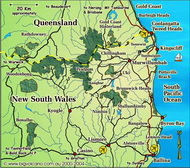 They gradually established rural holdings and over the years the valley has grown into one of the richest agricultural areas in New South Wales. The Tweed is noted for dairy farming, beef cattle, sugar cane, sawmilling, bananas, smallcrops, exotic tropical fruits, and fishing. All this, plus our golden beaches through to the lush rainforests of the hinterland overlooked our famous landmark, Mt. Warning, add together to create a Tourist Paradise - could we say all made possible by the Cedar Cutter. The cedar cutter was carved by Ian Shaw of Tumbulgum. The figure, 2 metres high, is genuine red cedar. Tweed Shire Council provided invaluable assistance in the erection of the project. 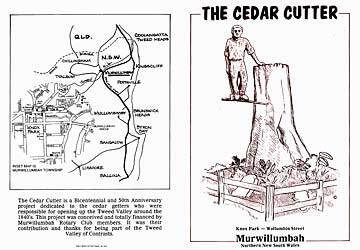 The Cedar Cutter is a Bicentennial and 50th Anniversary project dedicated to the cedar getters who were responsible for opening up the Tweed Valley around the 1840's. This project was conceived and totally financed by Murwillumbah Rotary Club members. It was their contribution and thanks for being part of the Tweed, Valley of Contrasts. Text and brochure images © from original brochure "The Cedar Cutter" circa 1994.
reproduced with the kind permission of Phil Taylor, Taylor-Made cars. Brochure image scans and optimisation by David Palmer, Big Volcano® Tourism.